Operating as the “Tarantula Train” the Grapevine Vintage Railroad operates from Cotton Belt Depot in Grapevine, Texas to Fort Worth Stockyards along a section of the Fort Worth and Western Railroad. An additional excursion route operates from Fort Worth Stockyards over the Trinity River route giving unprecedented views of the Fort Worth skyline. Operating with predominantly steam traction the railroad does own a vintage GM GP7 no. 2199 which may also operate trains if the steam engine is not available. Details of this railroad can be found at www.tarantulatrain.com which is the website of the Grapevine Vintage Railroad. On 11th March 2005 Andy Read found himself in Grapevine to cover the Tarantula Train. On this particular day both of the Grapevine Vintage Railroads locomotives were out of commission and so the Fort Worth and Western Railroad provided one of their own GM GP7’s no. 1500. Below are some photo’s which Andy took on the day. Grapevine Vintage Railroad GM GP7 no. 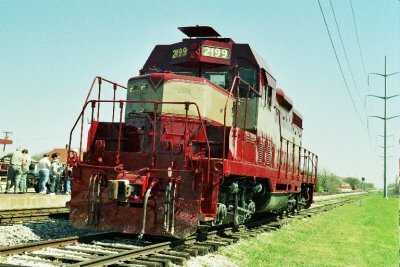 2199 at Grapevine, Texas 11th March 2005. Whilst running around it’s train FWWR GM GP7 no. 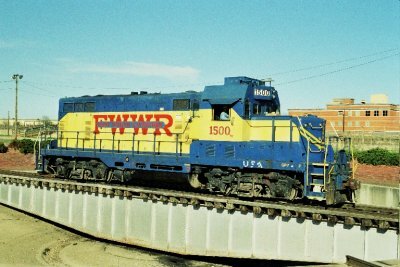 1500 rests on the turntable at Fort Worth Stockyards.